When We Were Boys (Director: Sarah Goodman): I was a big fan of Sarah Goodman’s first film Army of One (review) which premiered at Hot Docs in 2004 and so when I saw she had another film at Hot Docs, I was eager to see it. Unfortunately, it’s taken me several weeks longer than anticipated to finally sit down and watch it. 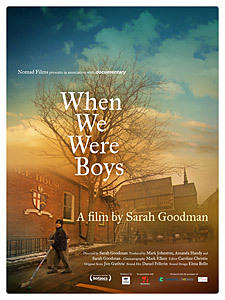 When We Were Boys is a vérité portrait of a private boys’ school here in Toronto, and it particularly focuses on the friendship between two boys. Noah is sensitive and polite, a good student and a standout in the choir. Colin is louder, more rambunctious, able to charm his teachers into letting him get away with things. We pick up the story in Grade 8, with the boys razzing each other while playing videogames. As Goodman’s camera follows them over the next year, we become immersed in the barely-controlled chaos that is school. Despite the boys’ privilege, they are just as energetic and restless as any other kids at that age. Many of them try to manipulate and charm their teachers, which although it happens elsewhere, seems particularly menacing given that within ten years, most of these kids will make more money than their teachers ever will. It’s hard to determine whether their sense of entitlement is just part of their generation or whether it has anything to do with their families’ wealth. Goodman begins the film with a long shot of the procession of expensive cars that drop their sons off each morning, and it very clearly makes the point that these boys are special. Their teachers drive the point home repeatedly as well, that they have great responsibilities to go with their privilege, but of course the message is lost on 13-year-old boys. As the film follows the boys into Grade 9, some of the minor characters drop into the background even further as it becomes apparent that Noah is being ostracized for some reason. It’s never clear exactly why he’s no longer popular, although it could have something to do with the fact that other students seem to think his family is wealthier than the rest of them. Noah takes it stoically, but some of the shots of him sitting alone at lunch or walking home are heartbreaking. His rejection by Colin is especially painful to watch. But then suddenly, the film skips another year into the future, and Noah and Colin are back in Noah’s basement playing videogames together. Noah tentatively asks Colin what happened, but doesn’t get an answer. That’s sort of the position the viewer is put in, as well. Goodman has beautifully captured the energy and shifting allegiances of boys at this age, but there’s very little sense of the boys’ inner lives. By picking boys rather than girls, she’s staked out particularly difficult terrain. Boys hardly talk to anyone about what’s going on in their heads at this age, never mind documentary filmmakers. So all we can see is their outward behaviour, which is guarded and superficial. The end result is that the viewer is left to project his own remembrances of adolescence onto the boys. The soundtrack almost encourages this, helping the film feel nostalgic even as events are happening. Ultimately, though, that didn’t feel satisfying to me. Noah seems like a very interesting character, and there is one scene where he talks somewhat freely to his barber about the expectations being put on him, but for me that was almost a tease. I suppose that wanting to know things the boys themselves may not know is putting unrealistic expectations on the film, but I can’t deny that I am still left wanting something more. This entry was posted in Documentaries, Film Festivals, Hot Docs and tagged #hotdocs09, adolescence. Bookmark the permalink. The film is opening tonight at the Royal Cinema here in Toronto, and is being distributed by my new employer, Kinosmith. Liam Lacey from the Globe and Mail gave it three stars and it’s getting very positive press in the rest of the print media here, too. Definitely worth a look.